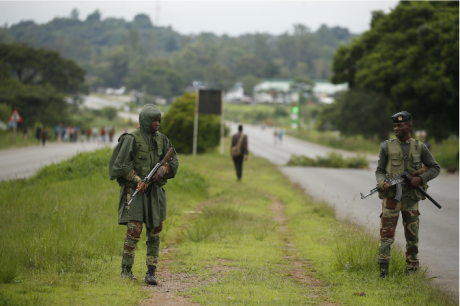 Soldiers patrol a highway from Harare to Bulawayo, Zimbabwe January 2019. Shaun Jusa/Xinhua News Agency/PA Images. All rights reserved.“A woman’s body is not considered hers and any man who wants it can have it”, said Thando Makubaza, a Zimbabwean women’s rights activist, responding to recent allegations of sexual violence against women by the army. Women’s bodies have been used as weapons of war since time immemorial -- and the experience of women in Zimbabwe’s latest civil unrest is no different. Women were hit hardest by price increases of basic commodities and also protested. Some were allegedly met with sexual violence by security forces -- though this aspect of the crackdown on protesters has gone under-reported. She described previous cases where authorities weren't the perpetrators, but still “women who made efforts to report, ended up being reprimanded, accused of being dressed improperly, or their behaviour having prompted the abuse”. Women were allegedly met with sexual violence by security forces -- though this aspect of the crackdown on protesters has gone under-reported. 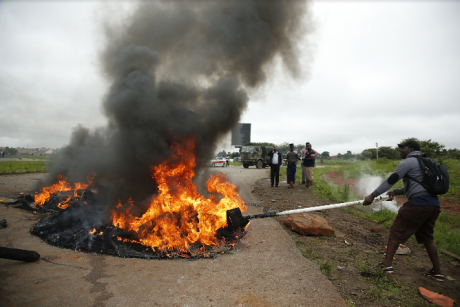 A protester burns tires to block a road, Harare, Zimbabwe, January 2019. Shaun Jusa/Xinhua News Agency/PA Images. All rights reserved.In a recent statement, the NGO Women’s Academy for Leadership and Political Excellence (WALPE), appealed for women who were sexually assaulted by authorities to seek medical treatment amidst high HIV rates in the country. WALPE accused the government of “curtailing women's active and effective participation in politics and leadership” in their crackdown on protesters. The Zimbabwe Women Lawyers Association (ZWLA) also released a statement calling on the government to end the impunity and adhere to the constitution and the country's UN obligations. The National Peace and Reconciliation Commission, she said, should "engage communities and put in place mechanisms that enable women who were sexually abused to share their experiences and come forward”. * This article is part of a series on women's rights and economic justice from 50.50 and AWID, featuring stories on the impacts of extractive industries and corporate power, and the importance of tax justice for the rights of women, trans and gender non-conforming people.